M11 is a beautiful object. 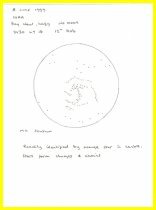 Lying in Scutum, it is an open star cluster known as the Wild Duck Cluster. Visually, it does bear a resemblance to skeins of duck seen against a winter sky. 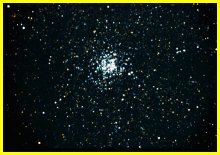 Photographically it does not, but it is not unusual for star clusters, be they globular or open, to look differently visually. It contains hundreds of stars and lies about six thousand light years away. The wide field image, taken through a small telescope, shows it lying in a rich star field.